I have the Lenovo Y510P and recently when I opened it to clean the fan I noticed there is a SSD slot which is empty in my case. I looked online a bit and I want to know if I buy one of these SSD from ebay will they be ok? And will I be able to run my windows and some applications with the SSD and have the rest of my files in the HDD? This however would not limit you from using the M.2 SATA slot for booting or cache similar to this discussion with fellow members and their choices of SSD that worked with them. You can have different option to go about using your storage as posted here and appreciate booting faster as same on this video booting on a Samsung 840 pro (here on different brands) . Highlighted links can be a good reference for your choice so take your time to review to what works best for you as this model would even allow you storage via ultrabay too. I am not looking to replace my HDD or use the ultrabay to add an SSD, I want to use that empty SSD slot that I mentioned in my post. From what I read, is that slot only capable of having a 24gb SSD? If so that means I wont be able to use those 2 SSDs that I mentioned in my original post? You can install an M.2 SSD and even make it bootable as you main Operating System , other options as well. Stock ssd option of 24GB is intended for cache, it does not limit you to use bigger capacity. The video shows booting of 128GB, 256GB, 512GB samsung 840 pro. On the other links shows booting to windows with bigger capacity as well like this. I am planning to buy this SSD in a bit just got few last questions. On this picture there is a screw at the end of the SSD, will that come with the SSD or do I need to purchaseit seperately? In your opinion, will a 128GB SSD be enough to boot windows 10 plus some applications or shall I go for a 256GB? There are model of Y510p that has an open M.2 space but no insertion port on it similar to this discussion so make sure that you have this gold contact port to use as the SSD m.2 that you would be purchasing suppose to have a screw that goes with it. Windows would take 16-20 GB for applications and update that needs OS integration so it can be approximately 20GB to 30 GB and that with a 128 GB would be enough . If the cost difference is small then 256GB is better. For best practice , always check return options or better yet have it checked with a spare SSD or with your local computer shop / IT guys (they most likely have a spare) to try . I opened my laptop yesterday to clean the fan and that is how I found out about the SSD slot. 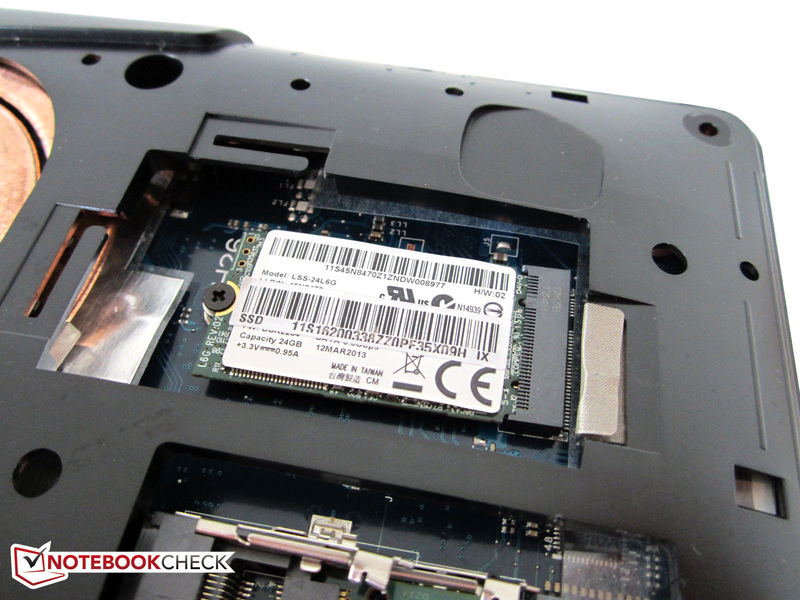 My laptop does have the part where the SSD goes in. I think I will go with this 128GB then since it will be enough, thank you. Good to know that you have this features on your model. I have just recently received my SSD that we discussed in this thread and I am not sure how to go with installing my windows 10 on it and using my 1TB hard drive just for my files. If you can help me with it I will really appreciate it!